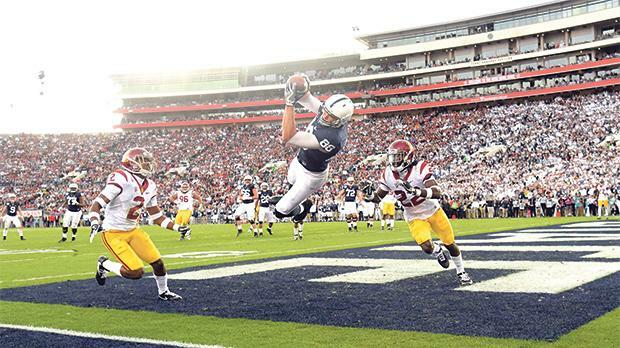 Penn State Nittany Lions tight end Mike Gesicki (centre) makes a catch for a touchdown against USC Trojans despite the marking of defensive backs Adoree Jackson (left) and Leon McQuay during the second quarter of the 2017 Rose Bowl game at the Rose Bowl, in Pasadena, California, on Monday. The annual college football game was played in front of a crowd of 64,500. The Trojans won the match 52-49.